What is a Learning Designer? Support roles and structures for collaborative eLearning implementation. 3 What does a Learning Designer do? ¶ 1 Leave a comment on Absatz 1 0 Im Zuge der fortschreitenden Digitalisierung setzen sich Universitäten weltweit damit auseinander, wie man online Studienangebote und Blended Learning Szenarios nachhaltig planen und implementieren kann. Dabei stellt sich die Frage, welche Supportstrukturen und –rollen notwendig sind, um Lehrende in diesem Veränderungsprozess effektiv zu unterstützen. Während die Diskussion über die Professionalisierung von universitären eLearning Supportrollen im deutschsprachigen Raum weniger ausgeprägt scheint, hat sich im angelsächsischen Raum die Rolle des „Learning/Educational Designers“ (Australien), „Instructional Designers“ (USA) oder „Educational Technologist“ (GB) etabliert. Sie fungiert als Schnittstelle zwischen Didaktik und Technik und unterstützt in enger Zusammenarbeit mit Lehrenden die verschiedenen Facetten der Implementierung von eLearning Angeboten. Der vorliegende Beitrag gibt einen kurzen Abriss der Literatur zum Thema eLearning Support und geht dann auf die Rolle sowie die verschiedenen Verantwortungsbereiche von Learning Designern ein. Mögliche Organisationsmodelle ebenso wie Faktoren erfolgreicher Zusammenarbeit werden ebenso angesprochen. Abschließend werden weiterführende Forschungsfragen und Zukunftsperspektiven aufgezeigt. Der Artikel basiert auf den Ergebnissen eines Reviews des Learning Design Supportmodelles an der Queensland University of Technology (Brisbane, Australien). ¶ 2 Leave a comment on Absatz 2 0 Higher education (HE) around the world is undergoing fundamental transformation. The shift from traditional models of education to connected, technology enabled, and learner-centered paradigms requires significant changes in culture, practice, process and policy. The institution wide introduction of blended or online learning models requires not only collaboration between and coordination across different institutional stakeholders (cf. ACODE 2012), but also the establishment of support resources who can provide expertise and support in the broad spectrum of educational technology use. One of the key questions to be addressed then is what types of support roles are required to help institutions in this shift, and how these should be organised and placed in the institutional structure to maximize their effect. ¶ 4 Leave a comment on Absatz 4 0 Yet even in academic cultures where the role is well established, one of the issues encountered in effectively providing support for eLearning is that the role is not well understood by the very people who should be supported by it – academic staff. This article aims to contribute to the understanding of professional roles and models in the implementation of online and blended learning in Higher Education by providing a snap-shot of the current facets and discussing future aspects of the role of the Learning Designer. It is based on the outcomes of a review project carried out by the authors at Queensland University of Technology in mid-2014, the aims of which were to evaluate the provision of learning design support, identify existing and emerging needs and drivers, and finally propose a future model of support for the University. Defining the role of the Learning Designer was a particular focus of the review, both within the institution, but also more broadly in the context of Australian HE. Data were collated from a range of sources, including a literature review of support models and roles for eLearning implementation, consultation with a range of internal stakeholders in the form of semi-structured interviews and focus groups, and expert interviews with representatives from five other Australian universities. The results were transcribed and analysed using a deductive data analysis method as proposed by Mayring (2000). 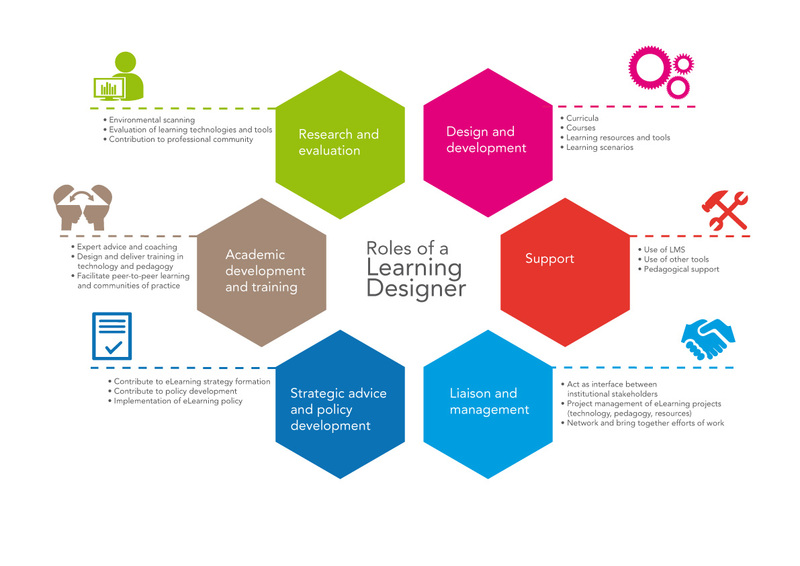 This contribution draws on the findings of the review with a particular focus on describing the changing role of the Learning Designer as a key collaborator, accelerator and connector in a rapidly changing environment. ¶ 6 Leave a comment on Absatz 6 0 The literature highlights academic development as a principal success factor in the effective implementation of any eLearning strategy. Several case studies point to the importance of deep collaboration between all stakeholders involved in transformative blended or online learning efforts. Communities of practice, peer-to-peer support, learning on the job and informal, localized learning are often referred to as successful ways to share knowledge, build local capability, and connect the various stakeholders (cf. Cochrane et al. 2013, Singh & Hardacker 2013). ¶ 7 Leave a comment on Absatz 7 0 Within this wider context of eLearning support, the importance of the role of the Learning Designer specifically, seen at the nexus of technology and pedagogy, is emphasized in several studies relating to eLearning implementation. Bichsel (2013) argues that more mature institutions have an increased number of support staff for eLearning initiatives and adds that “instructional designers and professional development staff are especially critical” (p.38). Similarly, benchmarks such as those developed by the Australasian Council on Open, Distance and eLearning (ACODE 2014) and the eLearning Maturity Model (Marshall 2007) also emphasize the need for adequate support in this space. ¶ 8 Leave a comment on Absatz 8 0 In the UK HE arena, the role of the Learning Technologist specifically has gained significant attention, with a number of reports and investigations seeking to define its strategic importance, scope, and competency profile (cf. Hopkins 2015, Browne & Beetham 2010, Shurville at al. 2009, Beetham et al. 2001). The critical literature review by Shurville, Browne and Whitaker (2009) in particular is seen as a baseline review in this field, drawing on over 200 sources to define and discuss the various facets of the role as well as the complexities in establishing it within HE institutions. In the US HE context, the role is typically called “Instructional Designer”. The themes emerging from the literature however are similar to those in the UK, with topics such as the variety of the role, organizational structures, challenges and how to overcome them prominent in the discussion. (cf. e.g. Moskal 2012, Intentional Futures 2016). ¶ 9 Leave a comment on Absatz 9 0 There are several national and international professional associations for Learning Technologists such as the Association for Learning Technology (ALT) in the UK, the International Society for Technology in Education (ISTE), or the Australasian Society for Computers in Learning in Tertiary Education (ASCILITE) to name only a few. Certification programs for professionals seeking accreditation by these bodies are also available. In addition, there are many blog posts and other contributions on social media by learning technologists reflecting on the complexity of their role, and the difficulty in explaining it to others. A collection of particularly in-depth reflections on the role can be found in Hopkins (2015). ¶ 10 Leave a comment on Absatz 10 0 Building on the strong arguments for the importance of the Learning Designer as a key factor in helping teaching staff in the transformation towards blended and online learning approaches, the remainder of this article will focus on defining the evolving role and the scope of its various areas of responsibility, based on the outcomes of the QUT review mentioned above. ¶ 11 Leave a comment on Absatz 11 0 A commonly used definition of the role is that provided by ALT: “Learning technologists are people who are actively involved in managing, researching, supporting or enabling learning with the use of learning technology” (cited in Browne & Beetham 2010, p. 6). This is very broad, and can encompass a range of different types of activities which often evolve in response to particular needs within the institution and its organizational sub-elements. Therefore, in exploring comparative models of support, it is essential to contextualize the role within the entire range of techno-pedagogical support services. Many universities today provide such services, although they might be variously articulated. The institutions consulted as part of the review used titles as varied as learning / elearning / blended learning / educational / instructional designer, blended learning advisor, and educational technologist to denote the role discussed here. This multitude of titles is also mentioned in the literature (e.g. Intentional Futures 2016, p.8) and indicates both the broad spectrum of tasks carried out by the role as well as institutional differences and requirements. ¶ 14 Leave a comment on Absatz 14 0 The key responsibility areas and competencies resulting from the review correspond with those presented in the literature. The report by Intentional Futures (2016) identifies the four responsibility clusters “Design, Train, Manage and Support” for instructional designers, always with a focus on supporting faculty in the effective use of educational technology. In a 2001 report on the role and function of the Learning Technologist, Beetham et al. defined ten key clusters of activities: “Of these ‘keeping abreast of current developments in learning technologies’ scored most highly. All of the remaining nine were educational, developmental, interpersonal/communicative or strategic rather than technical activities.” (Beetham et al. 2001, p.5) In an analysis of 400 job announcements for educational technology professionals, Kang & Ritzhaupt (2015) found that traditional instructional design knowledge and skills, project management and technical skills are of high importance, but that so called “soft skills” (communication, interpersonal skills, customer service, organizational and leadership skills) are increasingly essential. This points to the collaborative nature and the increasing complexity of eLearning implementation within HE institutions. ¶ 16 Leave a comment on Absatz 16 0 Curriculum design and development: This area has traditionally not been a key responsibility for Learning Designers, who tended to be engaged in course design and development, (i.e. at the implementation stage) rather than the planning stage of new or programs or those under review. This may point to the fact that program offerings are increasingly being planned as online or blended programs and the use of technology has to be considered from the outset. At QUT, for example, Learning Designers now contribute systematically to curriculum design and development process which adds an additional component both to their competency profile and the set of responsibilities. ¶ 17 Leave a comment on Absatz 17 0 Academic staff development: Another trend observed at the institutions consulted is that there is increasing collaboration with traditional Academic development units (in some cases the eLearning department is even merged with these units). This may point to a broader tendency to view academic capabilities in blended and online teaching as part of their overall academic competencies rather than a separate, specialized skill. Increased collaboration rather than often observed competition between these areas will certainly benefit the institution as a whole. ¶ 18 Leave a comment on Absatz 18 0 The impact of the LMS: The implementation of institutions wide eLearning initiatives has been closely tied to the deployment of a Learning Management System (LMS), which has also strongly shaped the tasks of the Learning Designer. Whilst the role before the prevalence of the LMS was very much about designing and developing online resources (including software) for online Learning, the advent of the LMS has seen a shift towards Learning Designers focusing on training and supporting academic staff in the use of the system, and developing and implementing good practice examples, standards and policies. In what some call a “Post-LMS” era, this focus on LMS support shifts towards a much broader spectrum of technologies used for learning and teaching, with social media and other open source and proprietary tools becoming both more easily available and widespread throughout higher education teaching. The corresponding change in the role of the Learning Designer is towards a stronger focus on evaluating available tools and making recommendations, providing support and advice to academic staff planning to use tools beyond the LMS, and contributing to policies that help maximize the benefits but minimize the risks associated with this practice. ¶ 19 Leave a comment on Absatz 19 0 These findings reflect both the fact that the use of educational technology is becoming mainstream at least in the Australian HE context, and that the role of the Learning Designer evolves with the technological affordances available. Both aspects also emphasize the central importance of the role, the need for Learning Designers to engage in continuous professional learning, and to be prepared for a constant re-definition of the role’s scope of work and competency requirements. ¶ 20 Leave a comment on Absatz 20 0 There are variations in the ways universities organise their eLearning support. Common models include centralised or faculty-based models, or a hybrid model where the central and faculty services intersect. An unpublished survey conducted by Marshall (2014) found that of the total numbers of support staff across 26 Australian and New Zealand HE institutions around 70% (305) of support staff were located in a central team whereas around 30% (134) were embedded in faculties. The size of the organization plays an important role in the way support services are organized, as does the strategic importance given to online learning. ¶ 21 Leave a comment on Absatz 21 0 Half of the institutions interviewed as part of the review have a hybrid model with some staff in a central team and other distributed across the organisation. Central teams are often embedded in divisions or departments responsible for academic support more generally, whereas there was only one example of an eLearning support team being part of IT Services. All of the institutions however had either recently undergone a restructure, or were under review, or had new strategic initiative underway that would have an impact on the constellation of support teams and the roles of staff within them. ¶ 22 Leave a comment on Absatz 22 0 In practice, a stronger indicator of successful organisation than the location of support staff is firstly in how far the structure supports successful collaboration with faculty staff, and secondly whether the Learning Designers – if dispersed – have the opportunity to come together and share their knowledge, expertise and experiences. Browne & Beetham (2010) confirm this finding: “Whatever organizational structure is adopted, it is important for the stakeholders to consider how appropriate synergies can be facilitated, most particularly between educational technologists and academics […] (p. 216). The following chapter highlights some indicators of successful collaboration between Learning Designers and academic staff. ¶ 23 Leave a comment on Absatz 23 0 Productive relationships between learning designers and faculty staff are the basis for success in eLearning projects. Whilst the physical and organizational location plays a role, it is not the only indicator of success. The review found the following factors that contribute to successful collaboration between the stakeholders in online and blended learning implementation. ¶ 24 Leave a comment on Absatz 24 0 It is critical for Learning Designers to conduct effective and sustained communication with faculty staff about the kinds of services and support they can provide. Learning designers also need to have productive relationships with the other support staff they work with—for example, with academic developers or IT support staff — to support academic staff effectively and often act as “translators” between stakeholders in academic, technical and administrative areas of the organization. The need for excellent communication skills mentioned as key to the competency of a Learning Designers highlights this role. ¶ 25 Leave a comment on Absatz 25 0 One emerging trend in the organisation of support is the adoption of a project-based approach where support staff from different services come together to work with academic staff on larger scale curriculum development activities. This approach has recently been adopted by Queensland University of Technology in a push to digitally transform programs systematically and strategically. Initial feedback indicates that such approaches are having positive outcomes. ¶ 26 Leave a comment on Absatz 26 0 Another factor that improves the likelihood of sustainable impact is associating staff development activities with practical output, either within an established staff development program, or within a project-based curriculum development activity. Having faculties or disciplines set priorities for staff development activities within their group is a successful approach, improving the likelihood of buy-in from academic staff, who perceive that the development activities have discipline relevance and engage them in collaborative activities with a real outcome. ¶ 27 Leave a comment on Absatz 27 0 The innovative nature of learning design and academic development suggest productive possibilities for research output. However, in practice, Learning Designers are often limited in time and appropriate research skills. One strategy to overcome this problem is in research collaborations between academic staff and support staff, which can also be an important incentive for academic staff engagement in eLearning initiatives. ¶ 29 Leave a comment on Absatz 29 0 Are the roles of eLearning professionals in other national and cultural academic contexts different from those described here? How and why? ¶ 30 Leave a comment on Absatz 30 0 What perception do eLearning professionals have of their own role? What is the perception of their role amongst others (especially academic staff)? ¶ 31 Leave a comment on Absatz 31 0 What is the strategic relevance of these roles within their institution? In how far does this reflect the importance given to digital transformation efforts? ¶ 32 Leave a comment on Absatz 32 0 Is there a common competency profile and a career path for people entering the profession across the national HE sector? ¶ 33 Leave a comment on Absatz 33 0 In conclusion, as the nature of academic teaching is changing, support requirements will change with it. Support services and roles will need to continue to be agile and develop with the emerging needs of the organization, now and into the future. ¶ 35 Leave a comment on Absatz 35 0 ACODE Australian Council for Open, Distance and E-Learning (2014). Benchmarks for Technology Enhanced Learning. Retrieved from http://www.acode.edu.au/pluginfile.php/579/mod_resource/content/3/TEL_Benchmarks.pdf, last accessed 19/03/2016. ¶ 36 Leave a comment on Absatz 36 0 Arabasz, P., Pirani, J. & Fawcett, D. (2003). Supporting e-learning in higher education: Research study from the EDUCAUSE Center for Applied Research. Retrieved from https://net.educause.edu/ir/library/pdf/ers0303/rs/ers0303w.pdf, last accessed 24/02/2016. ¶ 37 Leave a comment on Absatz 37 0 Bichsel, J. (2013). The State of E-Learning in Higher Education: An Eye toward Growth and Increased Access. Research Report. Louisville, CO: EDUCAUSE Center for Analysis and Research. ¶ 38 Leave a comment on Absatz 38 0 Beetham, H., Jones, S., & Gornall, L. (2001). Career development of learning technology staff: Scoping study. Final Report for the JISC JCALT. Bristol: University of Plymouth. Retrieved from http://www.jisc.ac.uk/publications/reports/2001/cdssfinalreport.aspx, last accessed 13/04/2016. ¶ 39 Leave a comment on Absatz 39 0 Browne, T. & Beetham, H. (2010). The position of educational technologists in enhancing the student experience. Report funded by The Higher Education Academy under their Call4: Enhancing Learning and Teaching through the use of Technology. Retrieved from http://repository.alt.ac.uk/831/ last accessed 13/05/2016. ¶ 40 Leave a comment on Absatz 40 0 Cochrane, T., Black, B., Lee, M., Narayan, V., & Verswijvelen, M. (2013). Rethinking e-learning support strategies. International Journal for Academic Development, 18(3), 276–293. ¶ 41 Leave a comment on Absatz 41 0 Guiney, P. (2013). Organisational approaches to elearning in the tertiary sector: An annotated bibliography. Report commissioned by the New Zealand Government, Ministry of Education. Retrieved from http://www.educationcounts.govt.nz/publications/ict/organisational-approaches-to-e-learning-in-the-tertiary-sector, last accessed 01/03/2016. ¶ 42 Leave a comment on Absatz 42 0 Haughey, M. (2007). Organizational models for faculty support: The response of Canadian universities. In M. Bullen & D. Janes (Eds. ), Making the transition to e-learning: Strategies and issues. Idea Group Inc.
¶ 43 Leave a comment on Absatz 43 0 Hopkins, D., (ed.) (2015). The Really Useful #EdTech Book. CreateSpace Independent Publishing Platform. ¶ 44 Leave a comment on Absatz 44 0 Intentional Futures (2016). Instructional Design in Higher Education. A report on the role, workflow, and experience of instructional designers. Retrieved from http://intentionalfutures.com/reports/instructional_design/, last accessed 13/05/2016. ¶ 45 Leave a comment on Absatz 45 0 Kang, J. & Ritzhaupt A.D. (2015). A Job Announcement Analysis of Educational Technology Professional Positions: Knowledge, Skills and Abilities. Journal of Educational Technology Systems, 43(3), 231-256. ¶ 46 Leave a comment on Absatz 46 0 MacKeogh, K., & Fox, S. (2009). Strategies for embedding e-learning in traditional universities: Drivers and barriers. Electronic Journal of E-Learning, 7(2), 147–154. ¶ 47 Leave a comment on Absatz 47 0 Moskal, T.M. (2012). Instructional Designers in Higher Education. Retrieved from http://digitalcommons.unl.edu/cehsedaddiss/12, last accessed 24/02/2016. ¶ 48 Leave a comment on Absatz 48 0 Marshall, S. (2007) e-Learning Maturity Model. Process Descriptions. Wiki. Retrieved from http://www.cad.vuw.ac.nz/research/emm/documents/versiontwothree/20070620ProcessDescriptions.pdf, last accessed 29/02/2016. ¶ 49 Leave a comment on Absatz 49 0 Marshall, S. (2014). ACODE benchmarking activity—Academic and e-learning support in Australian and New Zealand universities. Unpublished. ¶ 50 Leave a comment on Absatz 50 0 Mayring, P. (2000). Qualitative Inhaltsanalyse. Grundlagen und Techniken. 6th edition. Weinheim: Beltz. ¶ 51 Leave a comment on Absatz 51 0 Singh, G., & Hardaker, G. (2014). Barriers and enablers to adoption and diffusion of eLearning: A systematic review of the literature—a need for an integrative approach. Education and Training, 56(2), 105–121. ¶ 52 Leave a comment on Absatz 52 0 Shurville, S, Browne, T. & Whitaker, M. (2009). Accommodating the newfound strategic importance of educational technologists within higher education. A critical literature review. Campus Wide Information Systems, 26(3), 201-231. ¶ 53 Leave a comment on Absatz 53 0  The label of the role varies considerably. In Australia, the role is also called “Educational Designer” and several other titles are emerging. In the US context, “Instructional Designer” is the most common name, and in the UK “Educational/Learning Technologist” is generally used. This myriad of job titles points to variations in the role, which depend on institutional, national and sector differences. A discussion of these specific differences is beyond the scope of this paper.